Its easy and inexpensive to take your music with you thanks to this Memorex mini system! Enjoy CDs, CD-Rs, cassettes and AM/FM radio stations in full stereo. 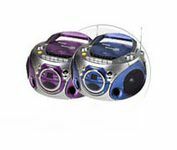 Features include 32-track CD programmability, bass boost and cassette recording. This was my best friend growing up. I listened to audio books all summer, and loved every second. This boom box got me through some tough times with its superb sound and it held up loyally for over 15 years. It has recently deteriorated, and I wish I could find an exact replacement for it. It is the single most loved and cherished electronic object I have, and ever will own.